It was Sunday afternoon, October 17, 2010 the second day of bow season, and I was headed into our “coffin corner” stand. My husband, Art, and I had hung, trimmed, and marked yardage earlier this year getting ready for the season. It was a warm sunny afternoon, and I had on my light camo & my heavier camo packed in my back pack knowing when the sun goes down it gets chilly. At around 5:30 p.m. I stood up in the stand because the deer movement increases that last hour. There were a couple of does and a small buck in the winter wheat field that I had been watching. When, all at once, they stopped feeding and looked towards the woods that was behind me. I was anxious to see what would step out. I saw the right side of the buck and thought to myself he might be the Lucidal Buck and he is a shooter. He came out and I ranged him at 44 yards, too far for me to shoot!!! I already had my bow in my hands, as I watched the buck grunt and chase the does in the opposite direction of the field. I thought I had nothing to lose, so I grunted and snort wheezed. Now, he didn’t turn on a dime or come in on a string like some hunters say, but he did slowly walk back towards me. I couldn’t believe it, he was at the 30 yard maker, I drew back my Mathews bow, picked a spot and watched it hit. This is something Art says to me over and over again while we are practicing. The buck jumped and ran 10 yards, then slowly made a big “C” in the field stopping and walking along the way. I knew the arrow was still in him. I stayed in the stand until I saw him exit the field. By this time it was getting dark. I texted Art and said I shot and was looking for blood and couldn’t find any. I told him where the shot hit and we agreed it was a liver shot and to back out of the woods and go home. Being a liver shot we knew not to push the buck and give him 3 to 4 hours. Now I had not told Art I thought it was the "Lucidal" Buck, I just told him he was a respectable buck. I went home and at 9:30 p.m. Art, myself and our nephew Cody (who is 12 and was in the stand with Art that night) headed out with flashlights. We looked and looked and found only one spot of blood at 11:30 p.m. Knowing it was not going to rain and was cold we decided we would back out and go home and continue in the morning. We called our friend, Ron Kelch, and told him I had hit a buck and asked if he would help us track him in the morning. We told Ron to be at the house at 8 a.m.
At 8 a.m. the next morning, after a sleepless night, the three of us headed to the stand on the 4 wheeler. I was cutting across the field to go to the stand to tell them where I saw the buck leave the field, when I saw blood, and a lot of it. Art and Ron had gone to where we found blood the night before. They followed the blood trail into the woods and found the broken arrow. Ron walked up over the top of the hill, while Art and I looked for more blood. We heard Ron say, "I found him and he’s down." Then he said, "It’s the Lucidal Buck!!" We ran up and Art was so surprised it was him. I was thrilled and thanked God to have the opportunity to harvest such a great animal. Art, Ron and Cody had all seen and watched the buck before the season, I had not, and the last couple of weeks no one had seen him. He had moved down from the bean fields into the woods, where we had the “coffin corner” stand. After taking a lot of pictures, and texting, we field dressed the buck. Then we took him to school and had Cody come out of class and see the buck since he had to go to school that day and couldn’t help us track him. He field dressed 210 lbs, aged at 8 to 9 years old and grossed 161-6 and nets 139-1 making New York State Big Buck and Pope and Young record books. 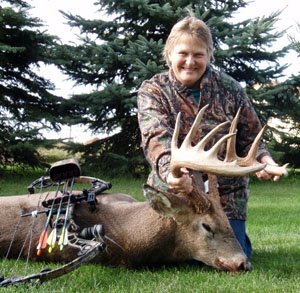 This was the second deer I have harvested with my bow in my twenty year hunting career and was the biggest deer I have harvested with either the bow or gun. Thanks to Art for all the patience he shows and all he has taught me in the hunting world! I have been truly blessed!